Editor's note: this week is Severe Weather Awareness Week in Colorado. Each day, KiowaCountyPress.net is bringing you information from the National Weather Service about spring weather dangers. Wednesday's article can be found here. During this Severe Weather Awareness Week in Colorado, remember that threats from thunderstorms include tornadoes, straight line winds, hail, flooding, and lightning. Tornadoes are often the headline story but damaging straight line winds can also injure and kill animals and humans. These winds are usually caused by an area of air within a storm which is quickly cooled by precipitation, or by the evaporation of precipitation. This area of cooled air, which is heavier than the surrounding air, accelerates downward. As the cool air slams into the ground, it spreads out from the area of impact. This process, in extreme cases, can result in wind speeds exceeding 100 mph. Weather forecasters call these winds microbursts if they are less than 2 1/2 miles across and macrobursts if they are greater than 2 1/2 miles across. These downbursts of cool air can be life threatening to pilots, and can cause extensive damage, injuries, and deaths at ground level. Do the best you can to get indoors during all storms, because high winds can quickly develop, causing items on the ground to turn into swiftly moving missiles that can injure or kill. 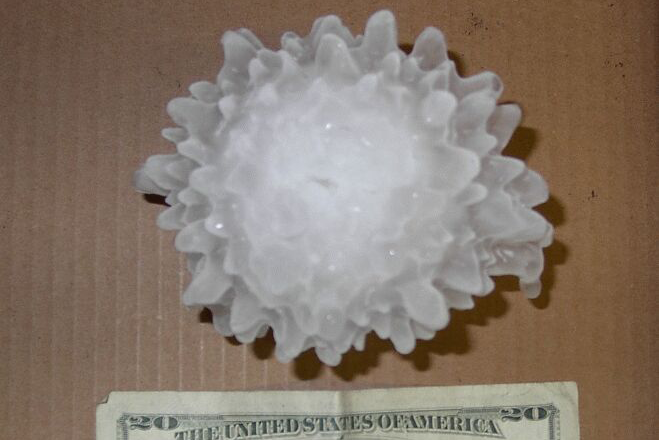 Hail often occurs in Colorado. Hail forms within storms as liquid water freezes in the cold mid and upper levels of the storms. 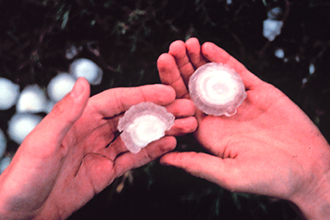 The hailstones are kept aloft by strong updraft winds for a time, and then cascade to the ground. In Colorado, hailstones vary from pea size, around 3/8 of an inch in diameter, to softball size, around 4 1/2 inches in diameter. Hailstorms in Colorado have caused billions of dollars of damage to vehicles and buildings in Colorado. Hail also causes significant damage to crops and can be life threatening to both animals and people. The National Weather Service issues severe thunderstorm warnings for winds of 58 mph or higher or for large hail one inch in diameter or larger. When a severe thunderstorm warning is issued for your area, move to shelter. When thunderstorms threaten you this severe weather season, tune to NOAA Weather Radio All Hazards. Wherever you are during threatening weather, plan out the actions you would take if severe weather were to strike.